This column appears in the April 25 issue of ESPN The Magazine, on newsstands this week. On March 30, the U.S. women's national soccer team, a globally dominant force of undeniable gifts and obscene marketability, filed a complaint against U.S. Soccer, a move of considerable brass a long time coming. For decades, USWNT players waited for their employers to recognize and reward their efforts, to acknowledge the visibility and millions of dollars they were bringing to the party. Instead, the federation shrugged. So the USWNT filed a wage discrimination claim, hoping that perhaps by airing the federation's dirty fiscal laundry and bias, the World Cup champs might finally be paid equally to their male counterparts who lose. A male U.S. player, for example, earns $5,000 for losing a friendly, while a female player receives nothing. A man pockets as much as $17,625 for a win, whereas a victorious woman gets $1,350. Of course, FIFA, the sport's global governing body, has set the economic disparity model and turned it up to 11: The Women's World Cup field divvied up a pot 2.6 percent the size of the men's. But FIFA-nomics doesn't give U.S. Soccer an excuse to do the same. The USWNT filing is the latest clapback in the growing recognition of and protest against the unequal treatment of female athletes, many of whom still aren't paid a living wage. The few who are, such as female tennis players, must continue to refute retrograde nonsense such as the thunderously obtuse recent commentary from Raymond Moore, then the Indian Wells CEO and tournament director, who said that in his next life, "I want to be someone in the WTA, because they ride on the coattails of the men. They don't make any decisions, and they are lucky. They are very, very lucky. If I was a lady player, I'd go down every night on my knees and thank God that Roger Federer and Rafa Nadal were born, because they have carried this sport." Not to be outdone, top-ranked men's player Novak Djokovic augmented Moore's musings, questioning women's rights to equal prize money, insisting that men deserve more because more people watch men play. Well, sometimes. In the U.S. Open, the 2015 women's final sold out faster than the men's; from 2011 through 2014, the women's final netted higher ratings too. Not that it should matter. Sports are not a popularity contest. Yes, charm always pays, and superstars who make it rain for sponsors should benefit from their additional skill set. But that is gravy, not a salary or a winner's prize, and is a different issue. At base, the USWNT and others are fighting for equal pay for equal work for all the players doing their job. The output and sacrifices expected of any professional athlete are rigorous and demanding for both sexes. An ACL tear or concussion knows no gender. Why should a paycheck? Comments such as those from Djokovic (who apologized) and Moore (who "resigned" a day later) are not uncommon. They are echoed in kind, in policy or in compensation gaps. They are coded in language when the dominance of UConn women's basketball is viewed as a liability or a systemic failure while the same success from a men's team is seen as not only a dynasty but worthy of awe. They are buried in deals that cap earnings for women well below those for men with no discernible explanation. Cultivating insecurity as a method of control is a tactic as old as time. Make any population question its abilities, its right to be at the table, and you'll find it pliable and grateful for whatever crumbs might fall from the gilded plates. This reality-massaging is not as much a "war on women," a term slung with alarming casualness, as something far more insidious: an illusion that there's a path to the rewards you seek. You just have to find it, and navigate it, blindfolded, grateful for the opportunity. Female athletes, and women in general, have gotten wise to the fact that there is no path other than the one they machete-hack on their own. No one hands you power and equality, no matter how sweetly you ask. You must demand it. Sometimes it means hiring lawyers and "disappointing" people. Sometimes it means winning so much you make people sick of your winning. Sometimes it means banding with other women and legislating to get your paper. Billie Jean, Venus and Serena, Ronda, the USWNT, UConn and so many others, these are women who are no longer listening to anyone tell them what they need to be or what they deserve. They already know. And now they are telling you. U.S. women's soccer player Carli Lloyd talks about what her team has been through and done to deserve more pay, including winning the 2015 World Cup. 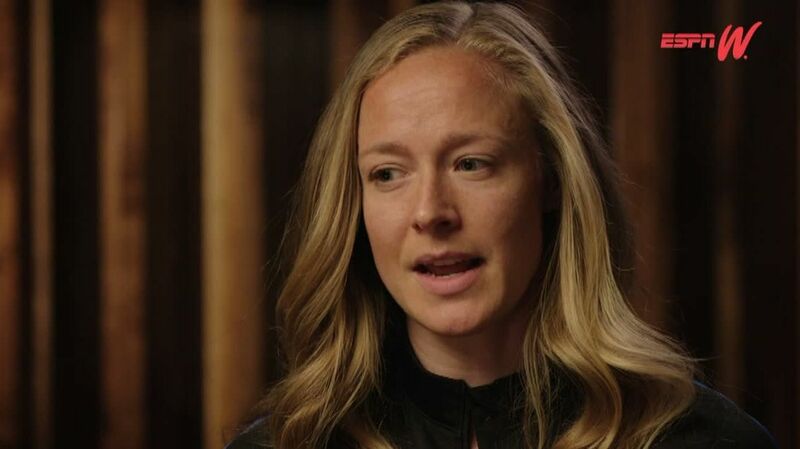 U.S. women's soccer player Becky Sauerbrunn talks about the ongoing issue with U.S. women's soccer getting paid less than the men's and doesn't rule out boycotting the Olympics if the issue isn't resolved by then.